Mexico is another country rich in rock and mineral resources. Unfortunately a lot of those resources remain unexplored. There is a great Trans-Mexican Volcanic Belt, which crosses the entire country at about the latitude of Mexico City. Volcano activity is responsible for many great rocks. At least sixty minerals were first discovered in Mexico. An estimated 1/3 of all silver that has been recovered from the Earth has come from Mexico. There are so many well known rock and mineral localities in Mexico. Mapimi, in the state of Durango, is perhaps the most well known one. It is famous for its wulfenite and hemimorphite mineral specimens. The rich copper ore that runs through Arizona continues south into the Sonoran Desert. Azurite and Malachite have been found at Sierra Madre and El Cobre. Milpillas, one of Mexico's newest mines is producing some outstanding Azurite and Malachite mineral specimens, as well as the beautiful blue and red rock Chrysocolla Cuprite, known as Sonora Sunset or Sonora Sunrise. Perhaps most fascinating are the giant gypsum crystals in a cave in Naica. Crystals as long as 60-70 feet are located there! Of course, that bad news is the temperature in the mine is about 140 to 150 degrees! Mexico is also a large producer of Agates. Though found in several Mexican states, the majority of well known Mexican Agates come from the state of Chihuahua. It is said there have been more than 80 types of Agates found here! Some of the many rocks from Mexico include: Crown of Silver Psilomelane, Crazy Lace Agate, Laguna Agate, Luna Agate, Wave Dolomite, Rainbow Obsidian, Spiderweb Obsidian, Silver Sheen and Gold Sheen Obsidian, Mahogany Obsidian, Selenite, Fire Agate and some of the most valuable Amethyst in the world. Mexico also mines significant quantities of lead and zinc. OakRocks has been in the rock and mineral business for 30 years. 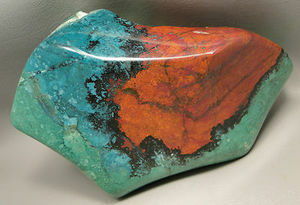 We have a great source for Mexican Rocks and Minerals and carry a large variety of both finished and rough materials.